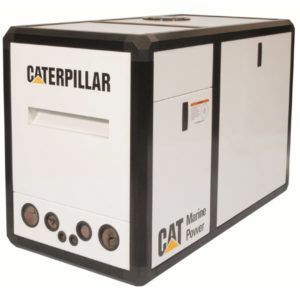 The Caterpillar Marine Generator Set is the first in a new range of clean, quiet, compact, and smooth-running generator sets. This range of small gen sets provides customers with a more comprehensive power offering, enabling them to enjoy the benefit of dealing with one supplier for both propulsion and auxiliary power. This compact unit provides required power on demand, operating very efficiently with optimum performance. Available as an open set or with a sound enclosure, this package is ideal for power requirements in any application. Low operating and maintenance costs are achieved through excellent fuel economy and a minimum of required maintenance. The single side servicing with extended services intervals makes maintenances easy. Fill in the online form and receive your personalized quote. Share the post "New range of Caterpillar marine generator set from 10 to 100 kW"